Initially, I was using a formed sheet-metal hidden hinge for my oil door. Similar to a number of products available from experimental AC suppliers. I didn't really like this solution. I thought there was too much flex in the hinge system to work with my push-button camloc latch. I was able to pop the door open with light outward force since the hinge would flex. I designed a new hinge that works much better. I am probably not the first to make it this way, but haven't seen it posted here. It works very well. The final version incorporates a spring to hold the door open. Total weight is only slightly more than the Vans setup, most of that is from the latch. Note: I made my oil door from aluminum. I had already drilled it for the formed hidden hinge, that is why there are extra holes. In the end, I filled those open holes with rivets. The hinge pivot could also just be a solid shaft. I machined bushing on my lathe. The bolts are fully torqued, the bushings have a step machined in to set the end-play. There is very little play (less than a piano hinge) to allow fretting of the door/cowl. Normally, on the pink cow at least, the area where I have the hinge mounted is a low spot between the cowl honeycomb core and the oil door flange. I filled this area with epoxy/flox for the hinge mount. Remember, the key issue with the oil door and hinge is how much it will flex. The inside of the cowl is pressurized. Check it in the shop by placing the cowl upside down on sawhorses and applying about 5-1/2 lbs of lead or similar in the center of the door. 5.5 lbs is 4.2" H2O applied to a 6x6" door, and would be about right for a standard RV cowl exit area at 200 knots VNE. A more closed cowl exit would increase door pressure to some higher level. A door which bows outward is a significant drag producer. Worse, you gotta look at it while you fly. In addition to flexing and causing drag as Dan points out, it might just pop open. As the middle of the door flexes, the latch moves closer to the edge and at some point it will be free. 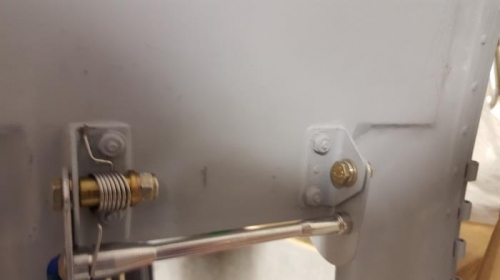 I've seen similar happen on other RVs but the good news is that a stiffener on the door resolved the issue. Would be pretty easy to do at this point. 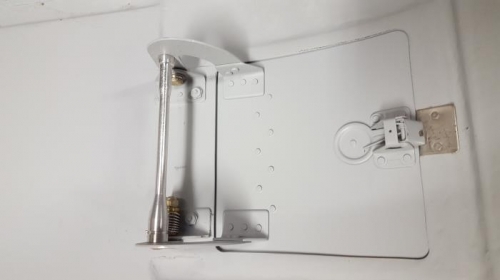 Now I would love to see the numbers on weight and drag comparison between such a nicely built mod vs standard piano hinge and the 'butterfly' wing shaped quarter twist latches. I also love these setups but is it actually making any performance difference or is it just aesthetically pleasing to the sole? I did do a weight comparison, I have a picture of the scale around here somewhere. If I recall, the difference was 2.X oz. That did not account for any added stiffeners on the Vans door. To Dan's point. With the old hinge I could pop the door with (guessing) less than 2lbs of force. The latch I have is not well suited to that type of formed hinge. With the new hinge, it is very stiff and does not allow any significant flex. I have tested it up to about ten pounds (guessing again) with no issues. I will have to do a more accurate test just to be sure. 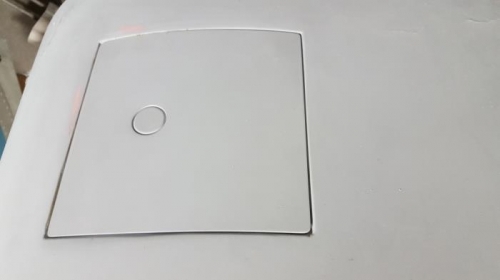 My oil door is made from 0.063 aluminum, it doesn't have the flex problems of the fiberglass door. I haven't seen a need for a stiffener yet. The hinge was my weak point before. 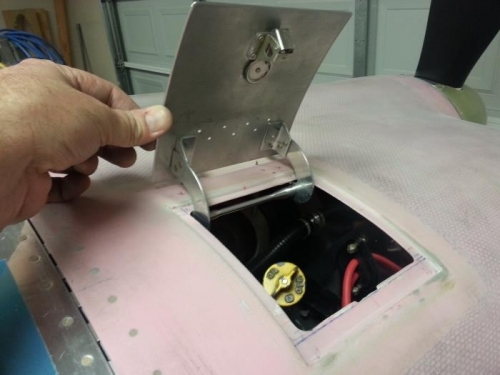 If you notice in the close-up picture below, the hinge pivot attached to the cowl on the left is longer than the right. The support rod also has a larger diameter there as well. The rod contacts the extended pivot as the travel stop for the door. So when open, the door does not use the cowl as a stop. In fact, the door or hinge does not contact the cowl at all when open. First, I really like the work you did on the oil door and hidden hinge. I found out that my oil door would pop open right at 200MPH with the same latch as you have, and I also have an aftermarket hidden hinge. There was no damage to the door when it would happen, but as Dan H pointed out, when it happens you have to look at it being open. I recognized that my fiberglass door would flex when I was building it, so I added two lateral stiffeners at that time. The result was a very stiff door, but the cowl itself, not so much. I watched the door come open several times and it was definitely the cowl that would puff up just enough to unlatch the door. My solution was to add two longer reaching latch pins at the corners. I did not want to give up my single button latch so I went with this more complicated arrangement that has worked well for the last 200Hrs. I like your solution. I will run some tests to see how much load it will take before unlatching. I made the tolerance on the latch pretty tight and added the stainless steel strike plate. Hopefully that will help.